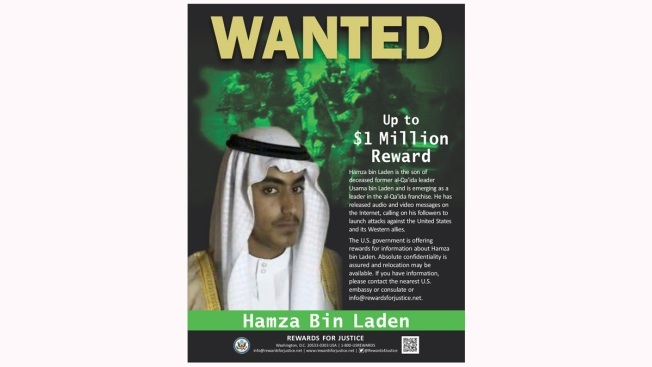 This wanted poster released by the U.S. Department of State Rewards for Justice program shows Hamza bin Laden. 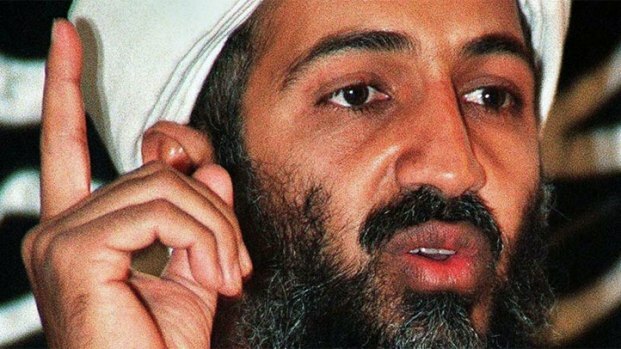 Saudi Arabia announced Friday, March 1, 2019, it had revoked the citizenship of bin Laden, the son of the late al-Qaida leader who has become an increasingly prominent figure in the terror network. There was no immediate explanation why the royal decree stripping his citizenship, signed in November, was only becoming public now. However, the announcement comes after the U.S. government on Thursday offered a $1 million reward for information leading to his capture as part of its "Rewards for Justice" program. The kingdom similarly stripped Osama bin Laden's citizenship in 1994 while living in exile in Sudan when Hamza bin Laden was just a child. Where he is now remains in question. "This is an example of history rhyming," said Thomas Joscelyn, a senior fellow at the Washington-based Foundation for Defense of Democracies who studies al-Qaida and the Islamic State group. "He's basically born right after al-Qaida is founded, so his life is totally consumed in the establishment, the formation of al-Qaida and the launching of its war against the West and America." Uniform of SEAL Who Says He Shot Bin Laden Goes on Display in Calif. 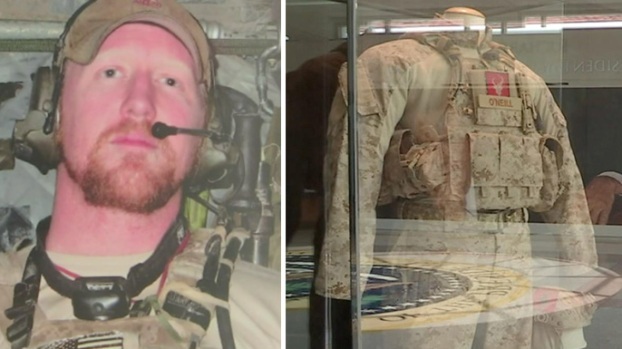 The combat fatigues of Robert O'Neill, the former Navy SEAL said to have shot and killed Osama bin Laden during a 2011 raid in Pakistan, are up for display at the Richard Nixon Presidential Library and Museum in Yorba Linda. O'Neill is scheduled to speak at the library on July 26, 2017. NBC4 talks with Joe Lopez, spokesman for the Richard Nixon Foundation. Saudi Arabia revoked Hamza bin Laden's citizenship in November, according to a circular by the Interior Ministry quietly published Friday by the country's official gazette. State-run media in the kingdom did not report on the decision. Bin Laden is believed to have been born in 1989, the year of the Soviet withdrawal from Afghanistan, where his father became known among the mujahedeen fighters. His father returned to Saudi Arabia and later fled to Sudan after criticizing the kingdom for allowing U.S. troops to deploy in the country during the 1991 Gulf War. He later fled Sudan for Afghanistan in 1996, where he declared war against the U.S.
As leader of al-Qaida, Osama bin Laden oversaw a series of attacks, including the 1998 bombings of the U.S. embassies in Kenya and Tanzania, as well as the bombing of the USS Cole off Yemen. He and others plotted and executed the Sept. 11, 2001 attacks on New York and the Pentagon, which led to the U.S. invasion of Afghanistan. U.S. Navy SEALs ultimately killed bin Laden in a raid on a house in Abbottabad, Pakistan, in 2011. For Hamza bin Laden, now believed to be around 30, his father initially worried for his safety and thought to send him away for study, but his son instead "wants to get into the fight," Joscelyn said. He's then sent away for explosives training in Pakistan. Video released by the CIA in 2017 that was seized during the Abbottabad raid shows Hamza bin Laden with a trimmed mustache but no beard, at his wedding. Previous images have only shown him as a child. The State Department said in its announcement Thursday about the $1 million bounty on him that it believes he married the daughter of Mohamed Atta, the lead hijacker in the Sept. 11 attacks. Hamza bin Laden began appearing in militant videos and recordings in 2015 as an al-Qaida spokesman. It may have been patriotism or the lure of a 25-million dollar reward. Whatever the motivation a few local people launched their own hunt for Osama Bin Laden. Some UCLA researchers even came very close to pinpointing the deceased al Qaeda leader's exact whereabouts. "If you think that your sinful crime that you committed in Abbottabad has passed without punishment, then you thought wrong," he said in his first audio recording. In recent years, the Islamic State group, which began as al-Qaida in Iraq before breaking away from the terror group, has taken much of the international attention. However, Joscelyn warned al-Qaida remains a transnational threat, something that authorities may now pay more attention to as the Islamic State group withers away in Syria. A United Nations report published last year noted that Hamza bin Laden "continued to emerge as a leadership figure in al-Qaida." It suggested both he and Ayman al-Zawahiri, who took over al-Qaida after Osama bin Laden's death, "are reported to be in the Afghanistan-Pakistan border areas." "Al-Qaida's leadership demonstrates strategic patience and its regional affiliates exercise good tactical judgment, embedding themselves in local issues and becoming players," the U.N. report warned. "While there is as yet little evidence of a re-emerging direct global threat from al-Qaida, improved leadership and enhanced communication will probably increase the threat over time."